Whenever I go to the grocery store, I pick up any discarded shopping lists I see (it’s my voyeuristic side). I found this one a few years ago. Totally normal on one side, and HELLO, pure pre-adolescent genius on the other. 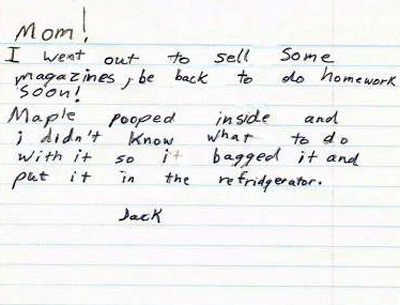 I always store me dogs poop in the refrigerator. Is there any other way?